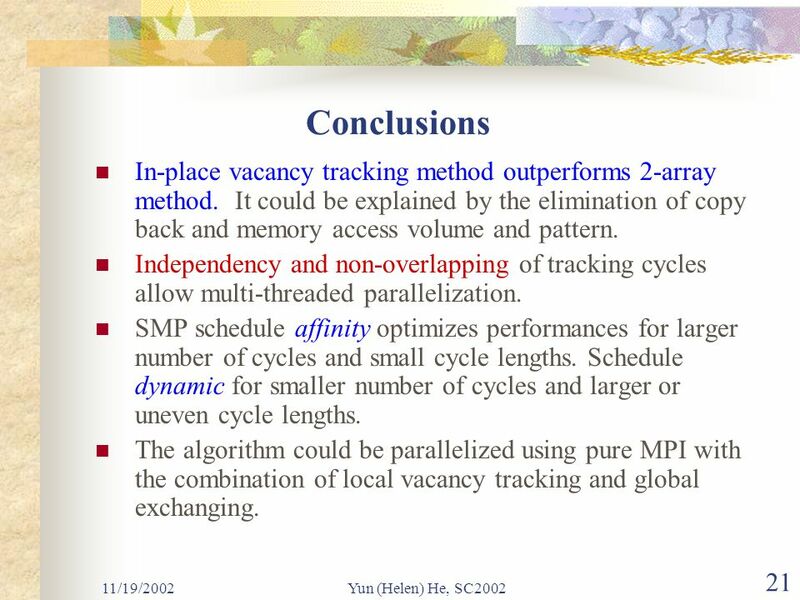 11/19/2002Yun (Helen) He, SC20021 MPI and OpenMP Paradigms on Cluster of SMP Architectures: the Vacancy Tracking Algorithm for Multi- Dimensional Array. 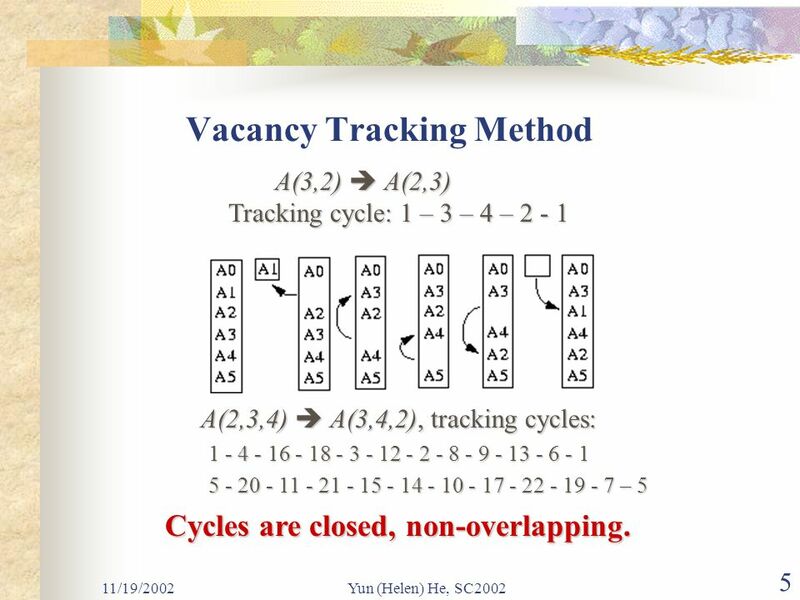 5 11/19/2002Yun (Helen) He, SC2002 5 Vacancy Tracking Method A(3,2)  A(2,3) A(3,2)  A(2,3) Tracking cycle: 1 – 3 – 4 – 2 - 1 A(2,3,4)  A(3,4,2), tracking cycles: A(2,3,4)  A(3,4,2), tracking cycles: 1 - 4 - 16 - 18 - 3 - 12 - 2 - 8 - 9 - 13 - 6 - 1 1 - 4 - 16 - 18 - 3 - 12 - 2 - 8 - 9 - 13 - 6 - 1 5 - 20 - 11 - 21 - 15 - 14 - 10 - 17 - 22 - 19 - 7 – 5 5 - 20 - 11 - 21 - 15 - 14 - 10 - 17 - 22 - 19 - 7 – 5 Cycles are closed, non-overlapping. Cycles are closed, non-overlapping. 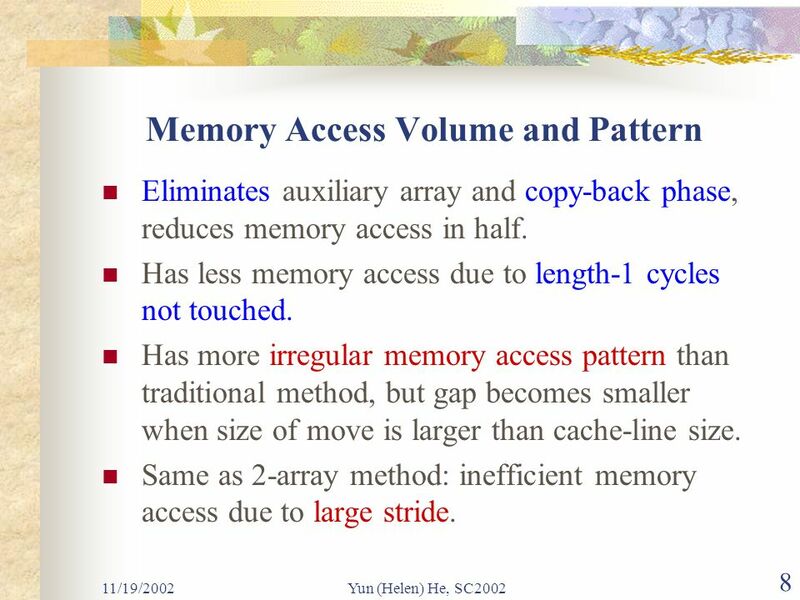 8 11/19/2002Yun (Helen) He, SC2002 8 Memory Access Volume and Pattern Eliminates auxiliary array and copy-back phase, reduces memory access in half. Has less memory access due to length-1 cycles not touched. Has more irregular memory access pattern than traditional method, but gap becomes smaller when size of move is larger than cache-line size. 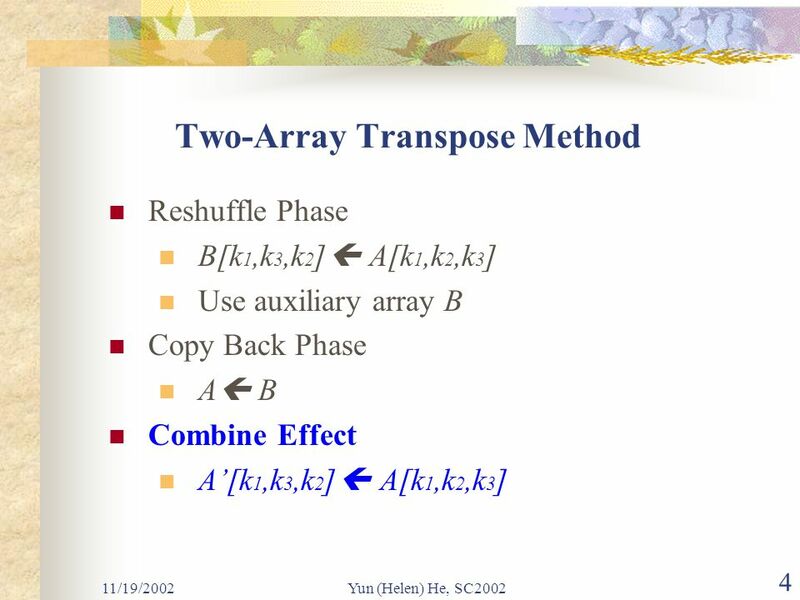 Same as 2-array method: inefficient memory access due to large stride. 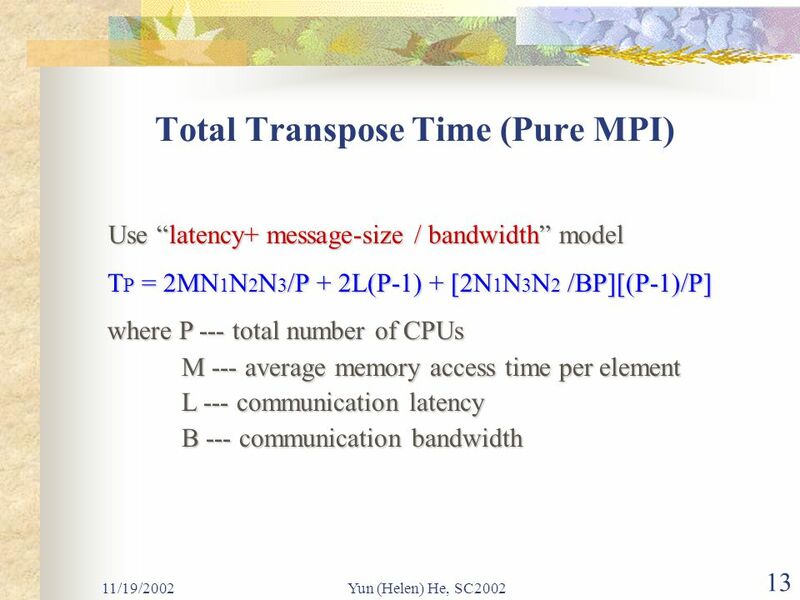 11 11/19/2002Yun (Helen) He, SC2002 11 Pure MPI A(N 1,N 2,N 3 )  A(N 1,N 3,N 2 ) on P processors: (G1) Do a local transpose on the local array A(N 1,N 2,N 3 /P)  A(N 1,N 3 /P,N 2 ). A(N 1,N 2,N 3 /P)  A(N 1,N 3 /P,N 2 ). 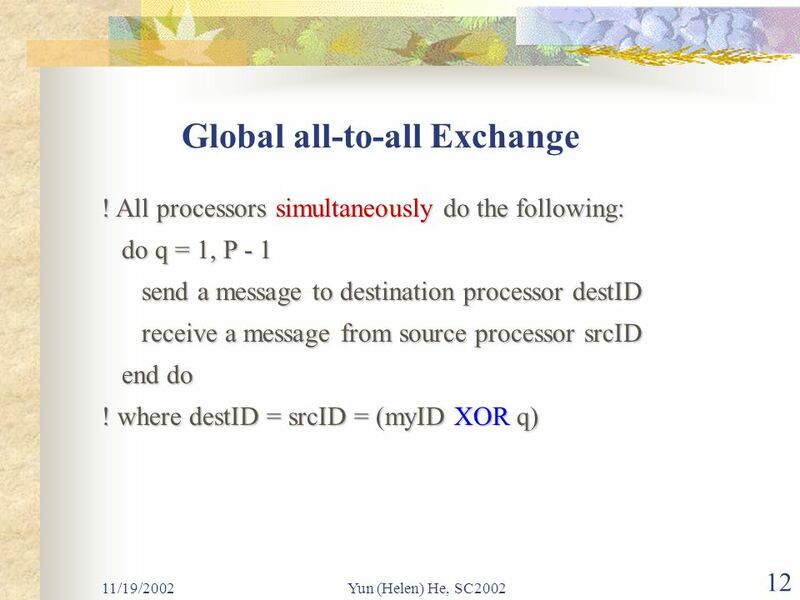 (G2) Do a global all-to-all exchange of data blocks, each of size N 1 (N 3 /P)(N 2 /P). each of size N 1 (N 3 /P)(N 2 /P). (G3) Do a local transpose on the local array A(N 1,N 3 /P,N 2 ), viewed as A(N 1 N 3 /P,N 2 /P,P) A(N 1,N 3 /P,N 2 ), viewed as A(N 1 N 3 /P,N 2 /P,P)  A(N 1 N 3 /P,P,N 2 /P), viewed as A(N 1,N 3,N 2 /P).  A(N 1 N 3 /P,P,N 2 /P), viewed as A(N 1,N 3,N 2 /P). 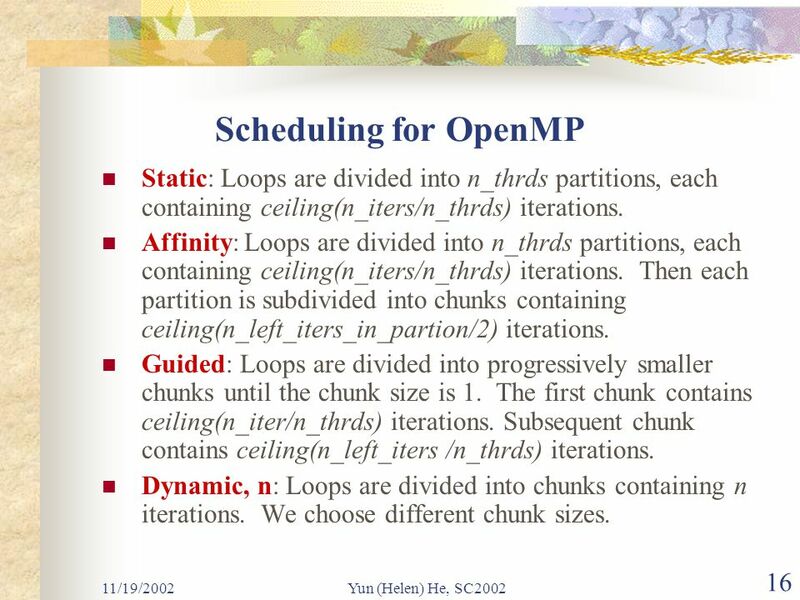 16 11/19/2002Yun (Helen) He, SC2002 16 Scheduling for OpenMP Static: Loops are divided into n_thrds partitions, each containing ceiling(n_iters/n_thrds) iterations. Affinity: Loops are divided into n_thrds partitions, each containing ceiling(n_iters/n_thrds) iterations. Then each partition is subdivided into chunks containing ceiling(n_left_iters_in_partion/2) iterations. Guided: Loops are divided into progressively smaller chunks until the chunk size is 1. The first chunk contains ceiling(n_iter/n_thrds) iterations. Subsequent chunk contains ceiling(n_left_iters /n_thrds) iterations. Dynamic, n: Loops are divided into chunks containing n iterations. We choose different chunk sizes. 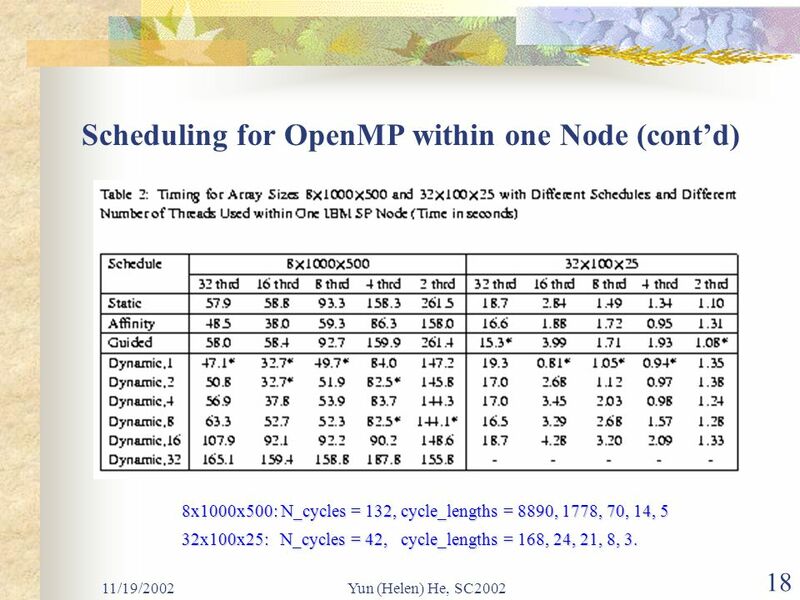 18 11/19/2002Yun (Helen) He, SC2002 18 Scheduling for OpenMP within one Node (cont’d) 8x1000x500: N_cycles = 132, cycle_lengths = 8890, 1778, 70, 14, 5 32x100x25: N_cycles = 42, cycle_lengths = 168, 24, 21, 8, 3. 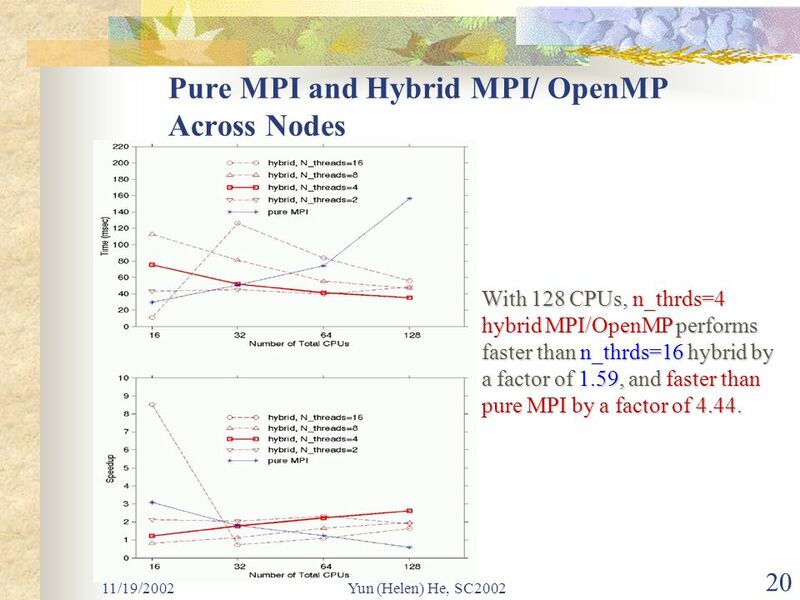 20 11/19/2002Yun (Helen) He, SC2002 20 Pure MPI and Hybrid MPI/ OpenMP Across Nodes With 128 CPUs, n_thrds=4 hybrid MPI/OpenMP performs faster than n_thrds=16 hybrid by a factor of 1.59, and faster than pure MPI by a factor of 4.44. 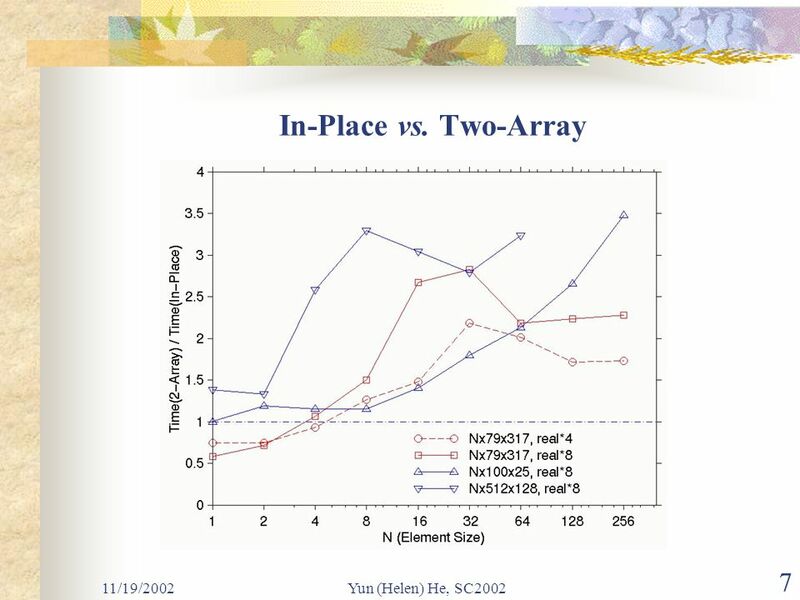 21 11/19/2002Yun (Helen) He, SC2002 21 Conclusions In-place vacancy tracking method outperforms 2-array method. It could be explained by the elimination of copy back and memory access volume and pattern. 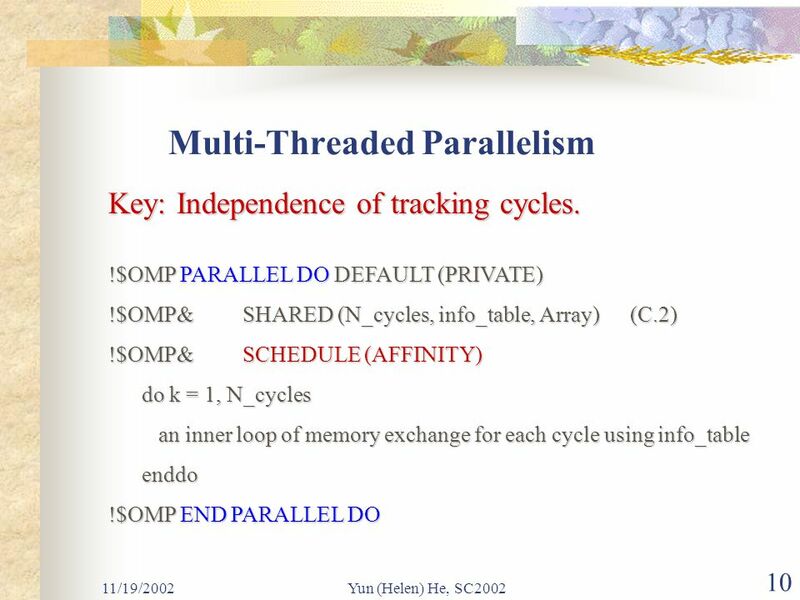 Independency and non-overlapping of tracking cycles allow multi-threaded parallelization. SMP schedule affinity optimizes performances for larger number of cycles and small cycle lengths. Schedule dynamic for smaller number of cycles and larger or uneven cycle lengths. 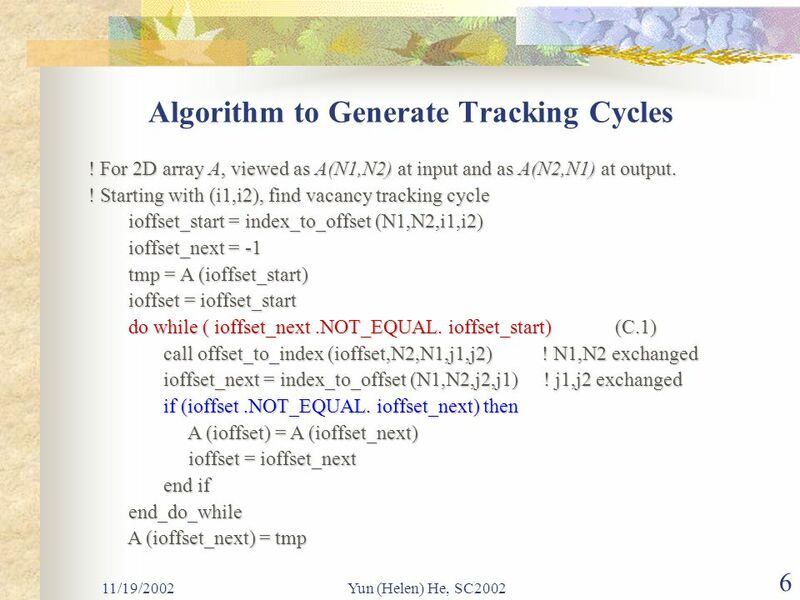 The algorithm could be parallelized using pure MPI with the combination of local vacancy tracking and global exchanging. 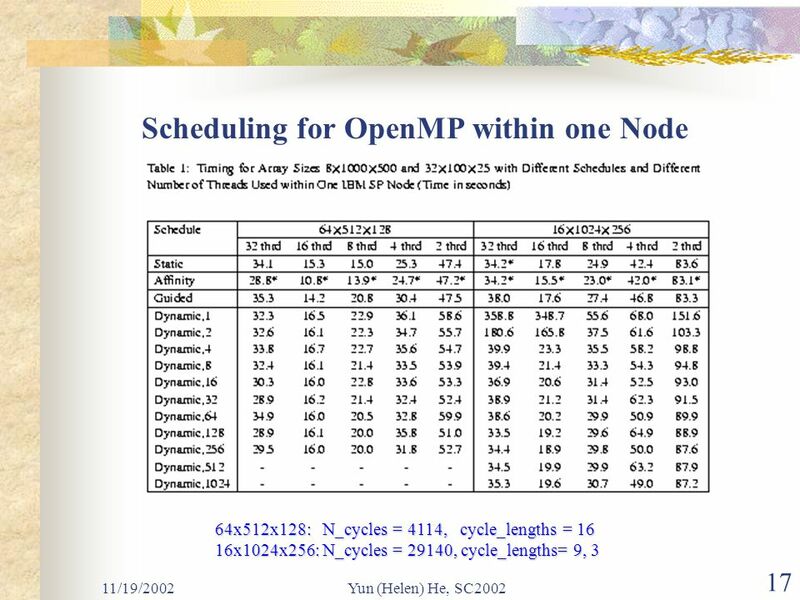 22 11/19/2002Yun (Helen) He, SC2002 22 Conclusions (cont’d) Pure OpenMP performs more than twice faster than pure MPI within one node. 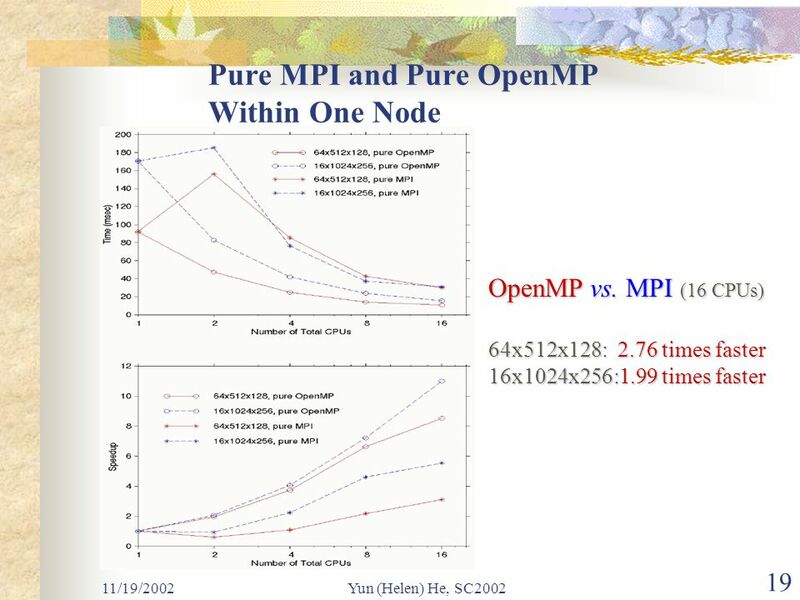 It makes sense to develop a hybrid MPI/OpenMP algorithm. 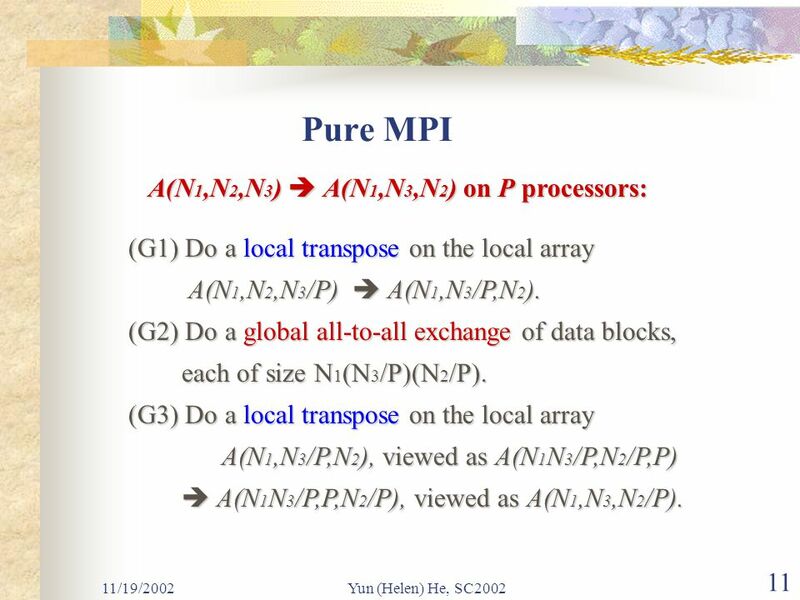 Hybrid approach parallelizes the local transposes with OpenMP, and MPI is still used for global exchange across nodes. 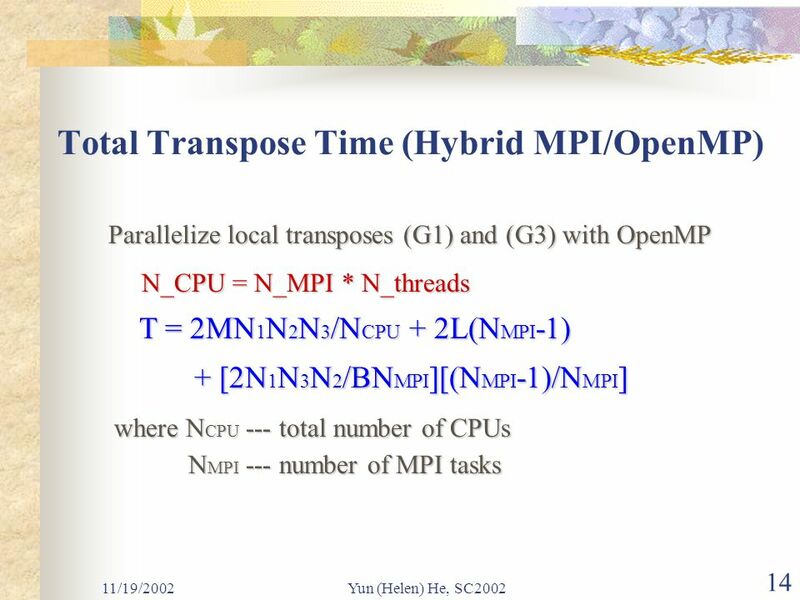 Given the total number of CPUs, the number of MPI tasks and OpenMP threads need to be carefully chosen for optimal performance. In our test runs, a factor of 4 speedup is gained compared to pure MPI. 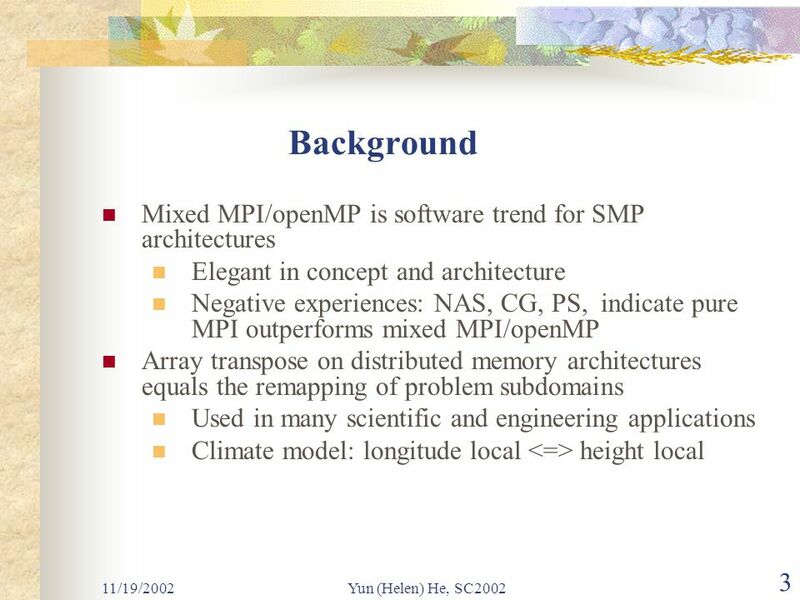 This paper gives a positive experience of developing hybrid MPI/OpenMP parallel paradigms. 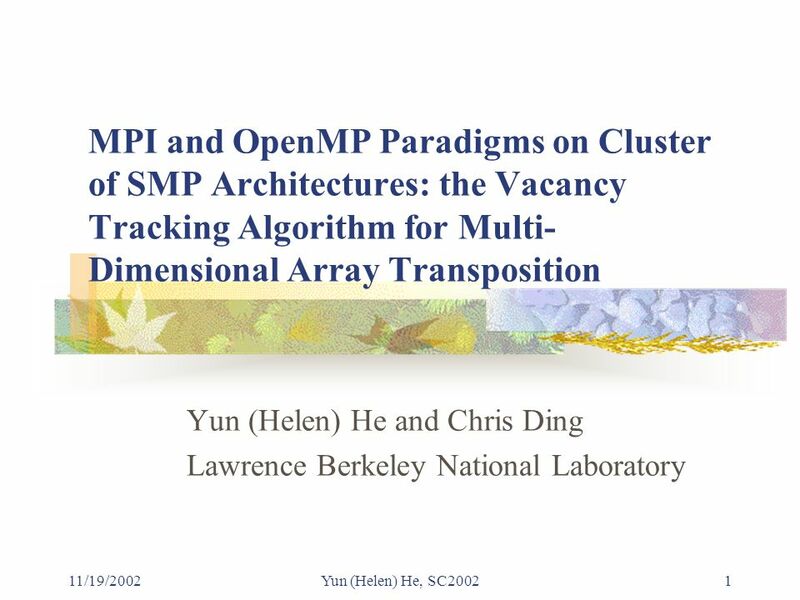 Download ppt "11/19/2002Yun (Helen) He, SC20021 MPI and OpenMP Paradigms on Cluster of SMP Architectures: the Vacancy Tracking Algorithm for Multi- Dimensional Array." Improving Parallel Performance Intel Software College Introduction to Parallel Programming – Part 7. 1 Towards an Open Service Framework for Cloud-based Knowledge Discovery Domenico Talia ICAR-CNR & UNIVERSITY OF CALABRIA, Italy Cloud. 1 Copyright © 2010, Elsevier Inc. All rights Reserved Chapter 1 Why Parallel Computing? An Introduction to Parallel Programming Peter Pacheco.